Friends, family and members of a soccer club gathered Wednesday in Hamburg, Germany, for a farewell match to honor a local teenager who was killed Sunday in Missoula, Montana. Seventeen-year-old exchange student Diren Dede was allegedly trespassing inside a garage when Missoula homeowner Markus Kaarma fired four times from a shotgun, killing the teen. Kaarma faces a charge of deliberate homicide. He claims Montana’s self-defense law allowed him to shoot Dede, his lawyer Paul Ryan told the Associated Press. The boy’s father said he never imagined his son could be shot for entering someone's property. "I didn't think for one night that everyone here can kill somebody just because that person entered his backyard," Celal Dede said, according to The Associated Press. 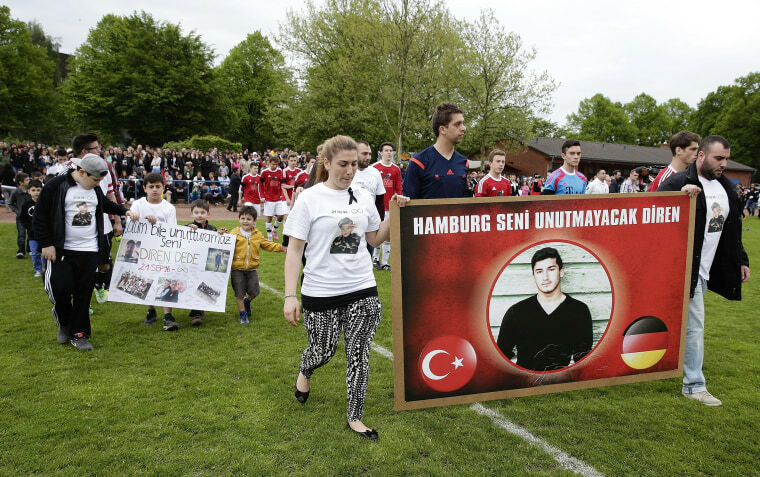 At the charity football match a banner saying "Our brother is dying while America is looking on" was hung.